BT is using "predatory" practices to destroy broadband competitors, particularly in rural areas, claims cross-bench peer Lord Erroll. BT is using "predatory" practices to see off its broadband competitors, particularly in rural areas, claims cross-bench peer Lord Erroll. Speaking at the annual All-Party Parliamentary Committee on Communications (ApComm) conference on Thursday, Erroll asked communications minister Ed Vaizey what the government was prepared to do to protect network operators who were providing services where BT was either providing a poor or non-existent service. Erroll said BT was allowing these operators to drive up demand for broadband, only to see BT decide to enable a nearby exchange and undercut the operator on price. He described these actions as "predatory". Vaizey did not reply directly to Erroll's question, but appeared to acknowledge that this was an issue. "Absolutely so," he said, before he was called away to vote in a division. A spokesman for the Department of Culture, Media and Sport said the minister had nothing to add to what was said at the meeting. He said, "We have one of the most competitive telecoms markets in the world, indeed, one of the most competitive broadband markets in the world. BT has one of the lowest market shares of any former incumbent operator and broadband prices in the UK are highly competitive. "Ofcom has set the market conditions which have delivered this competitive environment which of course we wish to maintain. Any evidence of specific anti-competitive practices should be reported to Ofcom who will investigate as appropriate." A BT spokesman said he would investigate any cases where these so-called predatory practices had been documented or where BT had driven local or community network operators out of business. Erroll's comments were echoed by the chief financial officer for Gamma Telecom, Gerard Sreeves. Its business model revealed BT behaving as if it were playing the Moles fairground game, where a "mole" pops its head out of a random hole, and BT "whacked it on the head", he told the conference. This was preventing new network operators from investing in broadband networks because BT's behaviour and its pricing advantage through the business rates system made it too risky, he said. In September, BT's regulated Openreach division, which builds network infrastructure, invited existing communication providers that use its fibre-based Generic Ethernet Access product to nominate exchanges they would like to see fibre-enabled. The trial runs from September to December. Participating communication providers may nominate up to six exchanges each in return for certain commercial commitments. 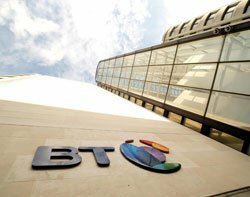 The chosen exchanges would be included in phase seven of BT's £2.5bn fibre upgrade programme to reach about 16.5 million premises by 2015. So far the six announced phases cover around seven million premises. In return for including an exchange, Openreach asked its customer to guarantee that 10% of premises served by the exchange would be using its fibre broadband within a year, or pay Openreach's costs for enabling the exchange. Also, if Openreach did not believe an area was viable for commercial deployment the communication provider would have to pay Openreach's "additional deployment charges" following a detailed survey that would cost the communication provider £5,000 per exchange. BT did not respond to requests for details on response to Openreach's invitation. BT is also running a competition called the "Race to Infinity" whereby consumers can vote to have their exchanges fibre-enabled. A BT spokesman said the data from this exercise would be shared with Openreach and help to influence its deployment plans. The scheme complemented the scheme noted above, he said. Malcolm Corbett, director of the Independent Networks Cooperatives Association, said he had asked BT to publish the details of the Race to Infinity programme so that he could make community network operators aware of the results. He said he was still waiting for BT to reply. However, the votes are available on the Race to Infinity website by clicking on the nominated towns. Interested parties have to aggregate the results for themselves. BT's regulated arm, Openreach, beat wireless broadband supplier Vfast to grab the high-speed broadband business for Iwade, a 1,350-premises village near Sittingbourne in Kent. After discovering in 2009 that Iwade was unlikely to receive high-speed broadband for several years, parish councillors applied to Kent Country Council (KCC) for a grant and issued a tender for a broadband connection for the village. KCC duly offered the grant, and Iwade received nine replies which offered a variety of technical solutions, said Nicola McKenzie, who helped manage the Iwade procurement process. McKenzie said the two finalists were Openreach and Vfast, a Kent-based wireless network supplier, which offered a Wimax-based system. Vfast director Darren Brown said that at the time the tender closed, Iwade's nearest exchange, Sittingbourne, was not on BT's upgrade schedule to provide fibre to the cabinet (FTTC), and therefore could not have bid. However, BT announced on 5 January 2010 that Sittingbourne was among the 63 new exchanges scheduled for an FTTC upgrade. According to Brown, Iwade effectively reopened the tender to be able to accept a bid from Openreach. Depending on the road route, Iwade is between 3.6 and 4.4 miles from Sittingbourne, or 4.3km as the crow flies. According to McKenzie, Openreach offered to hook up three of the village's four cabinets for free, leaving Iwade needing a grant of just £13,000 to cover the costs of linking the fourth. "We were very lucky," she said, adding the Openreach offer was "half the cost" of other bids. That saving allowed KCC to put the money towards other projects, she said. Brown said the original grant was worth some £49,000. This was enough to pay the capital cost of Wimax links to all the premises, at speeds up between 25Mbps and 50Mbps; subscribers would have paid £24.99 per month for access, he said. Brown was disappointed but philosophical about losing the contract. "That's business," he said. He added he did not want to say more because he dealt a lot with BT for other day-to-day issues.